Amplicom Powertel 765 Assure Responder Amplified Telephone - Weitbrecht Communications, Inc. The Amplicom Powertel 765 Assure Responder includes the Amplicom Powertel 760 Assure and a splash proof wireless PT601 wrist shaker. Hearing aid comaptible - TIA 1083 compliant. Adjustable volume, up to 50 decibels, and 3 equalizer tone control. Integrated Answering Machine with up to 11 minute playback time. Talk-back numbers and CID announce. Expandable up to 4 cordless accessories. 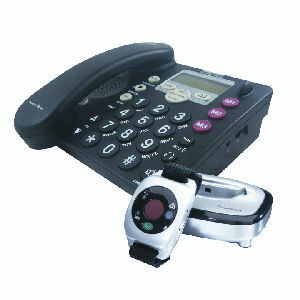 Corded telephone can be used in the event of a power failure. 1 splash proof wireless PT601 wrist shaker.